The Kanem-Bornu Empire was an empire that existed in modern Chad and Nigeria from the 14th to 19th centuries. The Kanem Empire (c. 700–1376) at its height encompassed an area covering much of Chad, parts of southern Libya (Fezzan) and eastern Niger, northeastern Nigeria, and northern Cameroon. The empire of Kanem formed under the nomadic Tebu-speaking Kanembu, who eventually abandoned their nomadic lifestyle and founded a capital around 700 CE under the first documented Kanembu king ( mai ), known as Sef of Saif. The capital of Njimi grew in power and influence under the Duguwa dynaty. The major factor that later influenced the history of the state of Kanem was the early penetration of Islam that came with North African traders, Berbers, and Arabs. By the end of the 14th century, internal struggles and external attacks had torn Kanem apart. Around 1380, the Bulala forced Mai Umar Idrismi to abandon Njimi and move the Kanembu people to Bornu on the western edge of Lake Chad. Around 1460, a fortified capital at Ngazargamu, to the west of Lake Chad (in present-day Niger), was built, but in the early 16th century Mai Idris Katakarmabe retook Njimi, the former capital. With control over both capitals, the Sayfawa dynasty became more powerful than ever. The two states were merged, but political authority still rested in Bornu. Kanem-Bornu peaked during the reign of the statesman Mai Idris Alwma. During the 17th century, the empire began to decline, and finally dissolved at the end of the 19th century. the Sefuwa dynasty: The name of the kings (or mai, as they called themselves) of the Kanem-Bornu Empire, centered first in Kanem in western Chad, and then, after 1380, in Borno (today’s northeastern Nigeria). The Kanem Empire: An empire (c. 700–1376) that at its height encompassed an area covering much of Chad, parts of southern Libya (Fezzan) and eastern Niger, northeastern Nigeria, and northern Cameroon. Its history is mainly known from the Royal Chronicle, or Girgam, discovered in 1851 by the German traveler Heinrich Barth. Duguwa dynasty: The line of kings (mai) of the Kanem Empire prior to the rise of the Islamic Seyfawa dynasty in 1068. According to the Girgam, they were the kings of Kanem; their dynastic name is derived from Duku, the third king of the Duguwa. jihad: An Islamic term referring to the religious duty of Muslims to maintain and spread the religion. Muslims and scholars do not all agree on its definition. Many observers—both Muslim and non-Muslim—as well as the Dictionary of Islam, talk of the term as having two meanings: an inner spiritual struggle and an outer physical struggle against the enemies of Islam, which may take a violent or non-violent form. mai: A term that in the history of the Kanem-Bornu Empire was used to roughly refer to a king. The Kanem Empire (c. 700–1376) at its height encompassed an area covering Chad, parts of southern Libya (Fezzan) and eastern Niger, northeastern Nigeria, and northern Cameroon. The history of the empire is mainly known from the Royal Chronicle, or Girgam, discovered in 1851 by the German traveller Heinrich Barth. The empire of Kanem began forming around CE 300 under the nomadic Tebu-speaking Kanembu. The Kanembu eventually abandoned their nomadic lifestyle and founded a capital around 700 CE under the first documented Kanembu king (mai), known as Sef of Saif. The capital of Njimi grew in power and influence under Sef’s son, Dugu. This transition marked the beginning of the Duguwa dynasty. The mais of the Duguwa were regarded as divine kings and belonged to the ruling establishment known as the magumi. Despite changes in dynastic power, the magumi and the title of mai would persevere for over a thousand years. The major factor that later influenced the history of the state of Kanem was the early penetration of Islam that came with North African traders, Berbers, and Arabs. In 1085, a Muslim noble by the name of Hummay removed the last Duguwa king, Selma, from power and thus established the new dynasty of the Sefuwa. The introduction of the Sefuwa dynasty meant radical changes for the Kanem Empire. First, it meant the Islamization of the court and state policies. Second, the identification of founders had to be revised. Islam offered the Sayfawa rulers the advantage of new ideas from Arabia and the Mediterranean world, as well as literacy in administration. But many people resisted the new religion, favoring traditional beliefs and practices. Kanem’s expansion peaked during the long and energetic reign of Mai Dunama Dabbalemi (ca. 1221–1259), also of the Sayfawa dynasty. Dabbalemi initiated diplomatic exchanges with sultans in North Africa and apparently arranged for the establishment of a special hostel in Cairo to facilitate pilgrimages to Mecca. During his reign, he declared jihad against the surrounding tribes and initiated an extended period of conquest. However, he also destroyed the national Mune cult and thus precipitated widespread revolt culminating in the uprise of the Tubu and the Bulala. The former was quenched, but the latter continued to linger on, leading finally to the retreat of the Sayfuwa from Kanem to Bornu c. 1380. By the end of the 14th century, internal struggles and external attacks had torn Kanem apart. Between 1359 and 1383, seven mais reigned, but Bulala invaders (from the area around Lake Fitri to the east) killed five of them. This proliferation of mais resulted in numerous claimants to the throne and a series of destructive wars. Finally, around 1380, the Bulala forced Mai Umar Idrismi to abandon Njimi and move the Kanembu people to Bornu on the western edge of Lake Chad. Over time, the intermarriage of the Kanembu and Bornu peoples created a new people and language, the Kanuri. But even in Bornu, the Sayfawa dynasty’s troubles persisted. During the first three-quarters of the 15th century, for example, fifteen mais occupied the throne. Around 1460, Mai Ali Dunamami defeated his rivals and began the consolidation of Bornu. He built a fortified capital at Ngazargamu, to the west of Lake Chad (in present-day Niger), the first permanent home a Sayfawa mai had enjoyed in a century. The Sayfawa rejuvenation was so successful that by the early 16th century, Mai Idris Katakarmabe (1487–1509) was able to defeat the Bulala and retake Njimi, the former capital. The empire’s leaders, however, remained at Ngazargamu because its lands were more agriculturally productive and better suited to the raising of cattle. With control over both capitals, the Sayfawa dynasty became more powerful than ever. The two states were merged, but political authority still rested in Bornu. Kanem-Bornu peaked during the reign of the statesman Mai Idris Alwma (also spelled Alooma or Alawma; the last decades of the 16th/the beginning of the 17th century). Alwma introduced a number of legal and administrative reforms based on his religious beliefs and Islamic law (sharia). He sponsored the construction of numerous mosques and made a pilgrimage to Mecca, where he arranged for the establishment of a hostel to be used by pilgrims from his empire. Alwma’s reformist goals led him to seek loyal and competent advisers and allies, and he frequently relied on slaves who had been educated in noble homes. He required major political figures to live at the court, and he reinforced political alliances through appropriate marriages. Kanem-Bornu under Alwma was strong and wealthy. Government revenue came from tribute (or booty, if the recalcitrant people had to be conquered), sales of slaves, and duties on and participation in trans-Saharan trade. 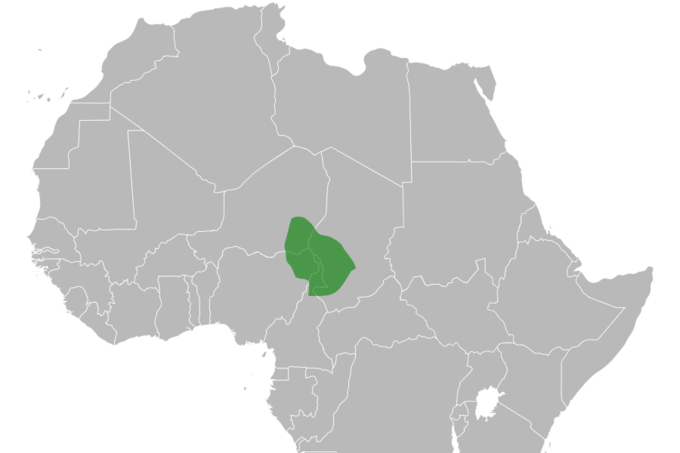 Unlike West Africa, the Chadian region did not have gold. Still, it was central to one of the most convenient trans-Saharan routes. Between Lake Chad and Fezzan lay a sequence of well-spaced wells and oases, and from Fezzan there were easy connections to North Africa and the Mediterranean Sea. Many products were sent north, including natron (sodium carbonate), cotton, kola nuts, ivory, ostrich feathers, perfume, wax, and hides. However, the most significant export of all were slaves. Imports included salt, horses, silks, glass, muskets, and copper. The administrative reforms and military brilliance of Alwma sustained the empire until the mid-17th century, when its power began to fade. By the late 18th century, Bornu rule extended only westward, into the land of the Hausa. Around that time, Fulani people, invading from the west, were able to make major inroads into Bornu. By the early 19th century, Kanem-Bornu was clearly an empire in decline, and in 1808 Fulani warriors conquered Ngazargamu. Usman dan Fodio led the Fulani thrust and proclaimed a jihad (holy war) on the irreligious Muslims of the area. His campaign eventually affected Kanem-Bornu and inspired a trend toward Islamic orthodoxy. But Muhammad al-Kanem contested the Fulani advance. Kanem was a Muslim scholar and non-Sayfawa warlord who had put together an alliance of Shuwa Arabs, Kanembu, and other semi-nomadic peoples. He eventually built a capital at Kukawa (in present-day Nigeria) in 1814. Sayfawa mais remained titular monarchs until 1846. In that year, the last mai, in league with Ouaddai tribesmen, precipitated a civil war. It was at that point that Kanem’s son, Umar, became king, thus ending one of the longest dynastic reigns in regional history. Bornu in the 18th century: The extent of the Bornu Empire in 1750. Although the dynasty ended, the kingdom of Kanem-Bornu survived. Umar could not match his father’s vitality,and gradually allowed the kingdom to be ruled by advisers. Bornu began a further decline as a result of administrative disorganization, regional particularism, and attacks by the militant Ouaddai Empire to the east. The decline continued under Umar’s sons. In 1893, Rabih az-Zubayr led an invading army from eastern Sudan and conquered Bornu. Following his expulsion shortly thereafter, the state was absorbed by the British-ruled entity that eventually became known as Nigeria. From that point on, a remnant of the old kingdom was (and still is) allowed to continue to exist in subjection to the various governments of the country as the Borno Emirate.